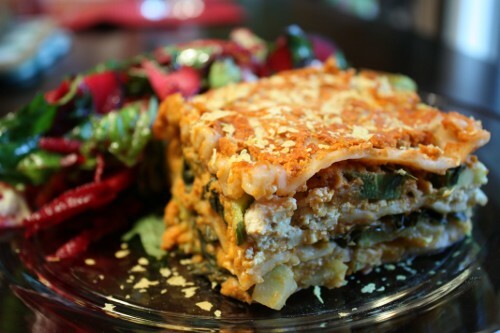 This creamy and “ricotta-cheesy” lasagna is not only delicious, it is packed with veggies! Unlike typical lasagnas that are loaded with fat and calories, this lasagna relies on the richness of cashews and tofu crumbles to create its cheesy layers. And if you want a lower calorie version or you’re avoiding nuts, you can substitute white beans for some or all of the cashews. Feel free to add any veggies you enjoy! In a blender, add the cashews (and/or beans), pasta sauce and water, and blend into a smooth “cheese sauce.” Add a little more water if needed. Boil a large pot of water. Cook noodles 6 minutes until slightly soft. Spread 1/4 of the cheese sauce in the bottom of a 9 x 13-inch glass pan. Place a layer of noodles over the sauce, using 4 noodles and leaving a little space in between them. Spread half of the veggies over the noodles and top with 1/4 of the cheese sauce. Place another layer of 4 noodles. Spread crumbled tofu over noodles and evenly spread garlic powder, onion powder, and salt on top. Spread the remaining veggies on top of the tofu. Top with 1/4 of the cheese sauce. Place the last layer of 4 noodles. Spread the remaining cheese sauce on the top (make sure to cover all edges of the noodles). Cover and bake 50 minutes. Uncover and bake 10 additional minutes. Cool 15 minutes before cutting and serving. Hi! I was wondering if it would be best to steam the vegatables or leave them the the way they are? Great question (and much apologies for the very tardy response)! Leaving the vegetables the way they are is just fine 🙂 Steaming them would be OK, too, but it is not necessary by any means. Might as well keep the recipe as easy as possible (that is my motto when cooking anyway).